Move over wooden and plastic blocks, Tono-8 Cork Blocks are here! Children, and adults, will have a ball creating all sorts of buildings, vehicles or silly characters with these totally unique and different building blocks. All that is needed is imagination and tons of creativity. Designed for children, the blocks have rounded corners and are soft and lightweight to handle. And not only are the blocks buildable and stackable, they are eco-friendly too. 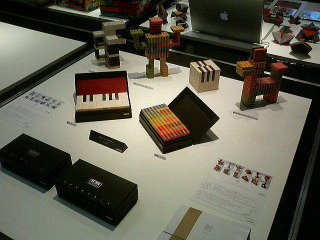 Made out of cork, the set includes16 blocks in three various shapes. 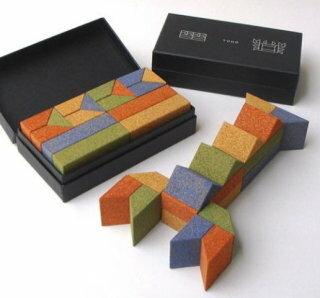 Designed by award-winning toy designer Tetsuo Tonouchi, the colored blocks are painted with non-toxic paints or are also available in a natural cork color. 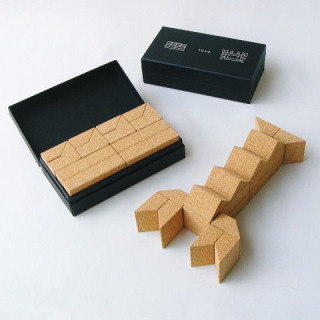 The set of Tono-8 Cork Blocks is packaged in a decorative and compact box. No pricing information is available yet.